Innovation has become an important focus for governments around the world over the last decade, with greater pressure on governments to do more with less, and expanding community expectations. Some are now calling this ‘social innovation’ – innovation that is related to creating new services that have value for stakeholders (such as citizens) in terms of the social and political outcomes they produce. Leadership – the qualities and capabilities of senior individuals within the organization. Each of these are analysed using data from a comparative EU research project in Copenhagen, Barcelona and Rotterdam. The book provides major new insights on how structures, networks and leadership in city governments shape the social innovation capacity of cities. It provides ground-breaking analyses of how governance structures and local socio-economic challenges, are related to the innovations introduced by these cities. The volume maps and analyses the social networks of the three cities and examines boundary spanning within and outside of the cities. It also examines what leadership qualities are important for innovation. 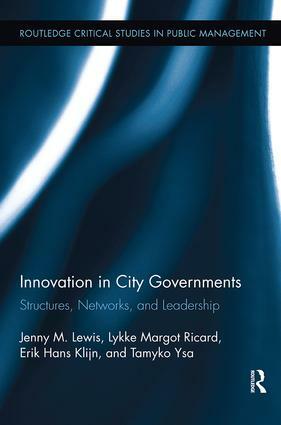 Innovation in City Governments: Structures, Networks, and Leadership combines an original analytical approach with comparative empirical work, to generate a novel perspective on the social innovation capacity of cities and is critical reading for academics, students and policy makers alike in the fields of Public Management, Public Administration, Local Government, Policy, Innovation and Leadership. Part 3: Conclusions: What Supports Innovation in City Governments? Jenny M. Lewis is Professor of Public Policy at the University of Melbourne, Australia. Lykke Margot Ricard is Senior Adviser on Innovation at the Faculty of Health and Medical Sciences, University of Copenhagen, Denmark. Erik Hans Klijn is Professor at the School of Social Sciences, Erasmus University, Netherlands. Tamyko Ysa Figueras is Associate Professor, Department of Strategy and General Management in ESADE Business School, Spain.